The therapeutic effect of the Karlovy Vary springs has been utilized ever since the Middle Ages. The spa became a tryst of aristocracy in the 17th and 18th centuries. The town's most valuable architecture has its origin in this period as well, the Baroque Church of St. Mary Magdalen, built by K. I. Dientzenhofer in 1727 - 1736. 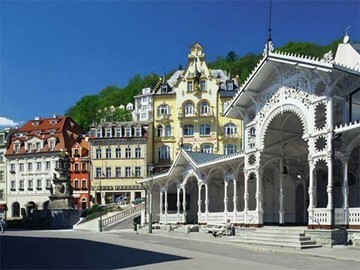 Though, the spa's greatest upsurge occurred only in the 19th century when Karlovy Vary became world famous.